We like clever work bench accessories; especially the kind that make our projects that much easier. [rstraugh] put up his version of the ubiquitous helping hands: thirdhand++. The arms are made from modular coolant tubing that’s made for machine tools. 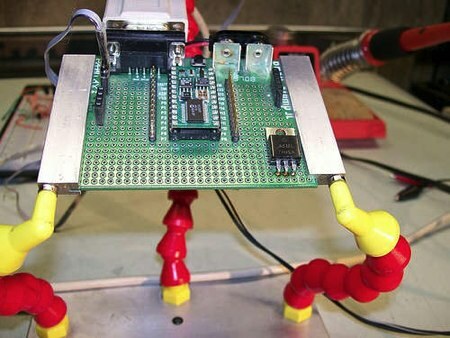 With the basic arms in place, he created several attachments – like this PCB holder, a LCD holder, the usual alligator clips and even an oscilloscope probe holder. I think the proper term for that piping is called “Articulated Hose” and yes. It is primarily used in the milling/lathe shops where coolant needs to be sprayed into the tools as they work to prevent tool wear. If you have a machine shop anywhere near you, go ask for some that is ‘old’ and they will give you bunches. It gets covered in gunk, and the plastic looks funky–nothing that a little bit of degreaser can’t take care of. Having made this, I’d say the one problem I’ve found is the circuit board holders are prone to rotating and letting the board fall out if you put no small amount of force to the board. It’s better to put the mounting holes in the circuit board holder as close as possible or underneath the circuit board groove so there is less of a moment arm. Also, the assembly pliers are indeed worth it, the coolant tubing can be a pain sometimes to assemble. One trick is lining up the two pieces on a screw driver and hitting it on the bench to pop them in place. Where do you get those hoses and nozzles in Europe for cheap?